Dr. Martina Rieker from the American University of Cairo gives a lecture on interdisciplinarity within the field in the MENA region. Dr. Martina Rieker (right), director of the Institute for Gender and Women's Studies at the American University of Cairo, and Dr. Dima Dabbous-Sensenig, director of LAU's Institute for Women's Studies in the Arab World. Rieker gave a lecture on "Interdisciplinarity and the Emergent Field of Gender and Women's Studies in the Middle East/North Africa Region" on May 20, at LAU Beirut. 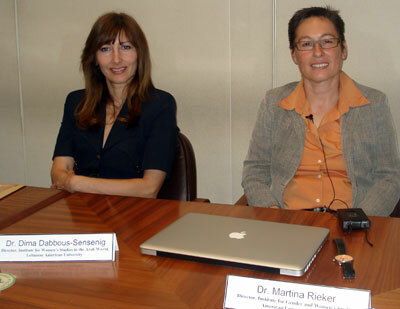 Dr. Martina Rieker, the director of the Institute for Gender and Women’s Studies at the American University of Cairo, gave a lecture entitled “Interdisciplinarity and the Emergent Field of Gender and Women’s Studies in the Middle East/North Africa Region” on May 20, at LAU Beirut. The lecture was organized by the Institute for Women’s Studies in the Arab World at LAU. “This lecture falls within IWSAW’s endeavor to establish a graduate program in gender studies at LAU, as set in its latest strategic plan,” says Dr. Dima Dabbous-Sensenig, IWSAW director. According to Rieker, gender and women’s studies is an emerging postgraduate field of study across the MENA region. “Despite the so-called (gender) rights deficit in the region, most prominently expressed by a battery of UNDP reports over the past decade, social science knowledge about women’s lives in the region is certainly not a blank page,” says Rieker. Among the audience members were LAU professors and students as well as researchers from various women’s NGOs, universities, and representatives from the National Commission for Lebanese Women and the Lebanese Council of Women.